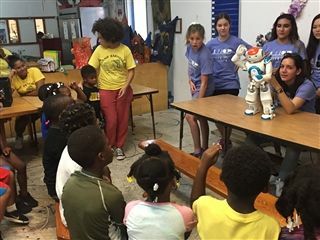 After becoming fully equipped with the features, limits and value of the NAO Humanoid robots, students then applied programming processes and their new skills to the needs of marginalized, inner-city children. They combined sound, music and their creative energies to develop entertaining performances to share with students from the surrounding Miami area. The week concluded with Network students passing along their learning, and supporting these students to create their own NAO Humanoid robot presentations.